Sometimes it is wanted to implant the telemetry or receiver subcutaneously. Implantable telemetry systems allow the measurement of physiological variables over long periods of time. Here no sensors need to be attached to the body surface. Implantable telemetry is mainly used in animal research and the equipment must be sheltered from the animals. In simple conditions the implantable telemetry system consists of a power supply, transducer which is connected to the transmitter. For long term telemetry, implant telemetry is more helpful. The whole electronic circuit is fully packed as a capsule and then implanted subcutaneously (under skin) or deep in the body. This is called encapsulation unit. Silicon encapsulation is commonly used. The telemetry transmitters are as small as possible. The weight and size of the batteries must be minimal and the operating lights must be maximal. Once a unit is implanted its service depends on the battery capacity. So the power source is of great importance. Mercury and silver oxide main batteries are used commonly. Depending on the application, the size and capacity of implantable unit battery varies. To save the power, radio frequency switches can be used to turn the system ON and OFF on depending on need. The use of implanted unit also limits the distance of transmission of the signal. Why PWM is used in multichannel telemetry system? PWM systems has a high noise immunity. Techniques are cheaper and less complex than FM system. PWM is lower sensitive to temperature changes. 1. One disadvantage of implantable telemetry unit is that the range of the signal is affected by the body fluids and skin which greatly attenuate the signal. For implant telemetry the size and weight limitations are much more serious than other types as heavy units can make the subject comfortless. 2. Some patients may be allergic to external materials and this can also make problems with implantable telemetry. 3. Proper protection of the patients is also a vital factor to be considered. In any means the patient will not be affected by the battery power supply. Branching method is a technique used when a given function does not contain any essential prime implicant in it. The solution to such a problem contains more than one set of solutions. There may be two independent sets of solutions, which may be regarded as two branches of solutions; hence the name branching method. Example 17: Reduce the expression S = S(0, 1, 5, 7, 8, 10, 14, 15). Solution: We solve the problem using the QM branching method. For this, we prepare the QM charts as shown below. It can be seen, we can form only two charts. Also we notice from Chart 2 that only eight pairs are obtained and that no quads can be formed from these pairs. 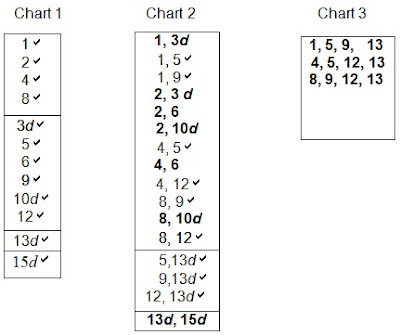 Now, from Chart 2, we obtain the pairs as A(0, 1), B(0, 8), C(1, 5), D(8, 10), E(5, 7), F(10, 14), G(7, 15), and H(14, 15). Table 2.14 shows the desired QM cyclic chart showing entries of these groups. In this scheme, we delete the terms covered by other implicants. For this, let us first choose A(0, 1). Then we strike out B since it contains 0. We next select E(5, 7) and strike out C(1, 5) as 1 and 5 are covered by A and E, respectively. Then we select D(8, 10) and H(14, 15) and delete F (10, 14) and G(7, 15) since the elements in them are already covered. The finally selected groups are A, D, E, and H, respectively. These are indicated in bold letters. The selection shown above is quite random, which suggests that there are other possibilities in this case. For example, we can choose B, C, F and G to form a second set of implicants. It can be clearly observed that the minimum number selected is half of the number of implicants present in this case. It can be seen that the modified QM technique is a general technique and can be easily applied to all types of logic reduction including the problems which use the branching method. We first solve the problem using the K-map method. 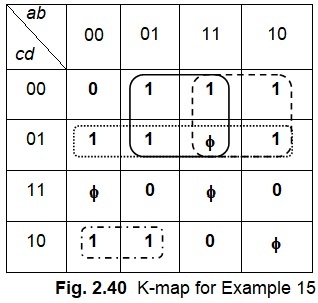 We prepare the K-map in this case as shown in Fig. 2.28(a). Notice that in this map, we have shown entries only in the cells mentioned in the given problem, i.e., we have shown 1 as the entry in the cells 0, 1, 5, 7, 8, 10, 14, and 15. The remaining cells are left vacant instead of filling them with 0s. This operation will help in identifying the pairs, quartets etc. without confusion. The cells left unfilled may be filled with 0s after the grouping operation is completed. This technique will be followed in this text for solving problem. From Fig. 2.28(a), we find that the reduced function is the same as that given by Eq. (2.37-b). Similarly, from Fig. 2.28(b), we get a second reduced function, which is the same as that given by Eq. (2.37-a). Example 12: Reduce S = S(0, 1, 2, 3, 6, 7, 8, 12, 13, 15). 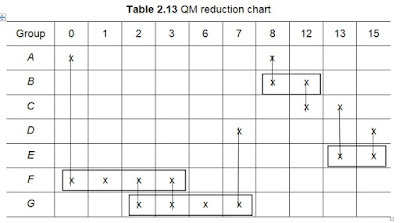 Step 1: The first step in the QM method is to separate the minterms into specific groups, as shown in Table 2.12. These groups are formed on the basis of the number of 1s in their binary form. For example, the binary number 0000 has no 1 in it and hence forms the first group. Binary numbers 0001, 0010, 1000, 10000, etc. have one 1 in them and are put together to form the second group. 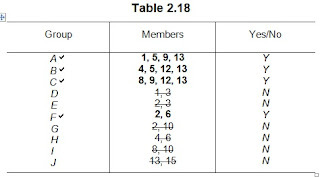 This process is continued to form groups with two 1s, three 1s, etc., as shown in Table 2.12. We shall make use of Table 2.12 to proceed further with our example. 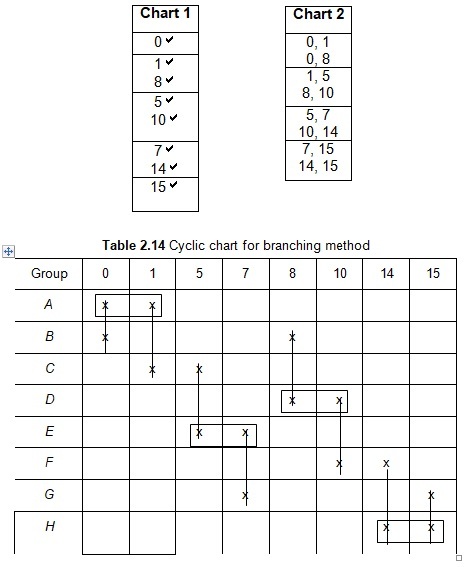 By comparison of the minterms in our example with the tabulation given in Table 2.12, we form the groups belonging to the first chart of the QM scheme. It may be noted that the members in each group differ in one-bit position only from the members of the adjacent group below (or above) that group. For example, ‘0’ in Group P and 1, 2 or 8 in Group Q differ from each other in one bit position only. This rule follows for all the subsequent groups in the first as well as other charts. It may also be noted that the groups are named as P, Q, R, etc. for the convenience of their identification. Once we are familiar with the procedure of groupings, this designation is not required as will be clear from the examples to follow. Now, the first column of the first chart shows the names of the groups as P, Q, R, S, etc. and the second column shows the member(s) in them. Thus we find that Group P has only ‘0’ as its member. Below this, in Group Q, we have numbers 1, 2, and 8 as its members. Similarly, every member of Q is different from every member of R in only one position. Thus, we conclude that the groups P, Q, R, etc. are chosen such that every member in a group differs in only one bit position from every other member in the group immediately above or below it. It may also be noted that this is not true for distant groups. Hence grouping and pairing is not possible among distant groups. Illustration 1: We can combine decimal numbers 0 and 1 as shown below to eliminate D.
As stated, in the pairing shown above, we find that variable D is eliminated. Illustration 2: As in Illustration 1, we find that decimal numbers 0 and 8 can be combined to eliminate A, shown below. Thus we find that appropriate pairing eliminates the variables appearing in the complemented and uncomplemented forms. In this way, one pairing operation between adjacent groups results in logic reduction by one bit. As stated previously, it may be noted that pairing must be done strictly between adjacent groups, i.e., between P and Q, Q and R, R and S, and so on. Pairing cannot be done between P and R, P and S, etc., as they do not obey the rule of difference-in-one-bit-position-only. The results of the pairing are tabulated, as shown in Chart 3. It may also be noted that when a pair is chosen, the corresponding numbers (in decimal form) must be marked with a tick (ü) sign so as to indicate that these numbers have already been selected. This is shown in Column 2 of Chart 3. 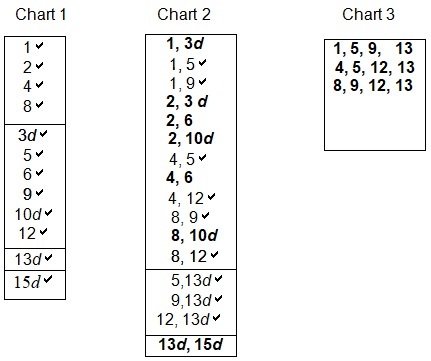 Column 3 shows the difference between the decimal numbers in each pair; it must be remembered that this difference must be exactly a power of 2, as indicated in Column 4. Usually, Columns 3 and 4 need not be shown in the charts; these can be easily avoided in practical solutions using the QM method. Here, they are shown only for illustration. It also may be noted that to find the difference between two numbers, decimal numbers are easier to remember and handle than binary numbers. For example, it is easy to subtract (mentally) 7 from 12 than subtracting 0111 from 1100. Also, it is easier to find that 12 –7 = 5 is not a power of 2 and hence pairing of 12 and 7 is impossible. Step 3: In Step 3, we make still lager pairings. For example, a pair from group P1 can be combined with a pair from the adjacent group Q1 if they differ by a power of 2. Thus, in Chart 3, the pair (0, 1) of Group P1 can be combined with the pair (2, 3) from Group Q1, as they differ by the same power of 2 (i.e., 20 = 1) between individual members and by 21 between the pairs. That is, between 0 and 1, the difference is 20 (= 1); between 2 and 3, difference is 20 (= 1). Now, to find the second condition, i.e., the difference between pairs, take any member in pair P1, say 0. We now find the difference between 0 and 2, its corresponding member in pair Q1. The difference can be seen to be equal to 2 (=21). Since the pairs (0, 1) and (2, 3) have satisfied our two conditions, we can combine them to form a quad P2. Once 0, 1, 2, and 3 are grouped, the grouping 0, 2, 1, and 3 can also be ticked off, as this quad has already been selected once. By checking out for groupings in this fashion, we find that we have one more quartet (i.e., 2, 3, 6, 7) available to us. No further pairings are possible in this group. The second set of groupings is shown in Chart 4. Step 4: The next step in the QM reduction process is to find whether pairing is possible from groups P2 and Q2 to form an octet. For this, we must see that individual members differ by the same pattern in both groups, and any member in one group differ by a power of 2 with the corresponding member in the other group. In our example, adjacent numbers of Group P2 differ by a factor of 1 (= 20) between them. Thus we observe that 0, 1, 2, and 3 differ by 1 from each other. Now, consider the members in Group Q2. These are, respectively, 2, 3, 6 and 7. Even though 2 and 4, and 6 and 7 differ by 1 from each other, the adjacent members 3 and 6 differ by 3 and hence the pattern of 1-difference-between-adjacent members is not followed here. So, in the first instance itself, these groups cannot be combined to form an octet. Thus, we stop at this point, and name the quad (0, 1, 2, 3) as final Group F and the quad (2, 3, 6, 7) as final Group G and encircle them, as shown in Chart 5. Step 5: The last step is to remove the common (or, redundant) terms, which have been selected more than once from different groups. 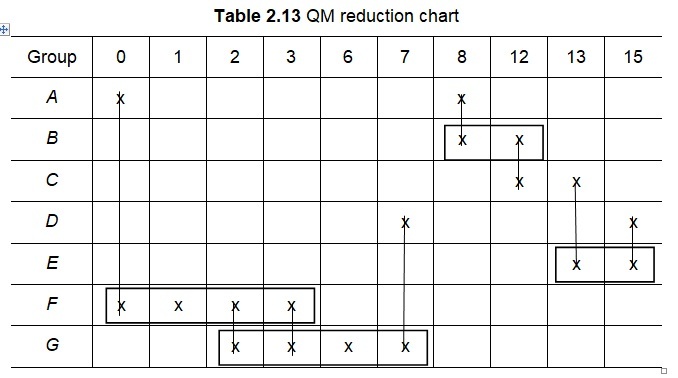 In the QM method, Table 2.13 is drawn as shown in for the reduction purposes. 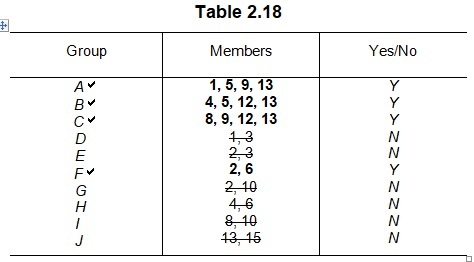 As shown in Table 2.13, the first column represents the names of the groups. The remaining columns are drawn to enter all the minterms in the given problem. In our problem, we have the minterms 0, 1, 2, 3, 6, 7, 8, 12, 13 and 15. So, we must draw tabular columns to accommodate all of these minterms. After drawing the rows and columns of Table 2.12 as shown, we mark ‘X’ in cells where there is an entry. For example, final Group A has entries in the cells under the columns designated 0 and 8. Similarly, Group F has entries under columns 0, 1, 2 and 3. In this way, we fill the relevant cells with entries from groups A, B, C, D, E, F, and G as shown. After having completed the filling of the cells, as explained above, we start the elimination process. In this elimination process, we have to remove the redundant terms (terms that have already been selected in various groups, and whose presence in the final logic expression will only add unnecessary extra gates). This is done as follows. Let us first consider the larger groups. In the given problem, groups E and F are larger groups (quartets). Each group has two common entries in 2 and 3. But E and F differ in the remaining two entries. So, we choose them as essential and encircle all their members. Example 13: Consider group F = 0, 1, 2, 3 (designated in decimal numbers). We now find the binary equivalent numbers of these decimal numbers and enter them one below the other, as shown in Table 2.14. This process is continued, as shown in Table 2.15 and the final SOP expression is obtained by combining the terms left in the right-most column of the table.